Take your photo with a digital camera at home and we will turn it into passport or visa photos for any country, in any size. 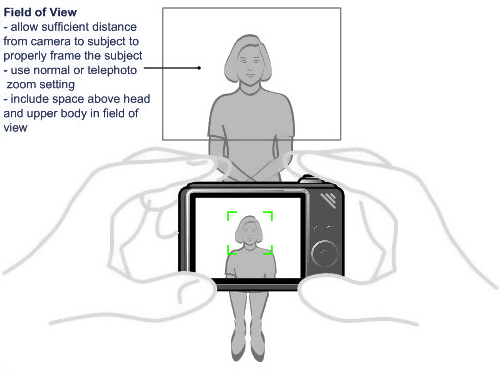 Following is simple guide for "How to take passport photos at home?". Follow these simple rules while taking photos for legal purposes like for passport or VISA application. If using flash, please stand 2 to 3 feet away from the background to minimize shadows on the background if using flash. If flash is turned off, Minimize the distance between the person being photographed and the background to reduce shadows on the background. X Your photo should NOT be a close-up. Face should be around 10%-20% of the photo or full shoulders (both) should be visible with some open space above the head. X Try to avoid shadows created by camera flash. We can fix some shadows but if the shadow is mixing with hair, we can not fix it. X Your photo should have enough resolution. File size of the picture must be more than 50KB. X Face in the photo should be uniformly exposed. One side side of the face should not be remarkably darker or lighter than the other. X Face should be stright or say both the ears should be visible. X Photo should not be over-exposed or under exposed. Still confused? Don't worry, just tick below and proceed to next step. We will verify your photo(s). I've read all the tips and looked at the example photos.